I just wanted to wish everyone a festive, fun and safe Halloween! And... if you get a moment, take a minute or two to raise a toast to those who have passed. While it has become a holiday of tricks and treats, it was once a celebration of the end of the harvest and a time of remembrance. Those that have come before us, make us who we are and are connected, in a line that goes all the way to the beginning of memory. Happy Halloween! Today is the Reveal for October's selection of the Inspired by Reading Book Club! 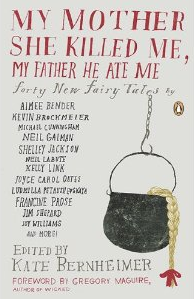 We read, "My Mother She Killed Me, My Father He Ate Me" edited by Kate Bernheimer. All of the participants agreed that the book was rich with imagery to pull from and was an excellent choice for our purposes. I really enjoyed the book. Some of contemporary literature's seminal giants retold classic fairy tales from around the world, breathing new life into the genre. The anthology of forty stories offered a selection of diverse voices, discovering fresh insight in familiar territory. It's kind of like discovering a tiny secret door to another world tucked in the roots of tree one passes every day. Since we're in the midst of the Halloween season, we decided to dress up to make the in-person meet-up more festive! 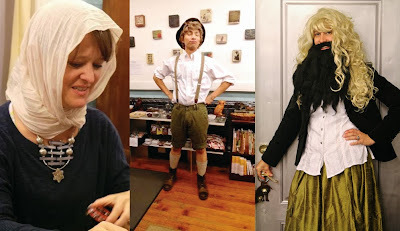 Above is a picture of Alison to the left as a Russian Snow Maiden, me in the middle as Hansel, and Laurel to the right as a bearded lady. To the left is Amy as flamingo in a mask her daughter made. (She tried Laurel's wig on for the photo.) To the right is Terri as a Ukrainian Babushka. Every month I look forward to book club! It's a lot of fun to get together with other creative people and share the things we've made and talk about the books we've read. For this meet-up, everyone brought something to share. Terri brought homemade chocolate chip cookies, Alison brought "Seven Deadly Sin Chocolate Cake" with seven different types of chocolate, Amy brought pumpkin gobs, Laurel brought handmade cards, and I provided an assortment of cookies, candy, cupcakes and of course, wine. No tricks... just lots of treats! This necklace was made by Laurel. She softened the macabre element with accents of pink. Instead of picking one story to focus on, Laurel said she wanted to capture the essence of the fairy tales; while there's magic and wonder, there's also lots of death. The necklace is made of a resin skull and cross bones pendant, carved blackstone spindle beads, quartz, mother of pearl, and pink seed beads. 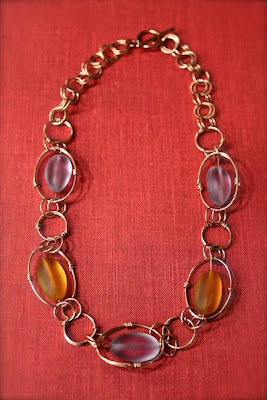 Here is another necklace that Laurel created. 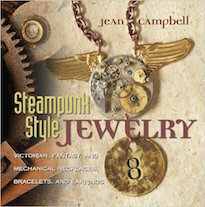 Again, the necklace was inspired by the fantastical stories in general. She included lots of circular links, referencing the hero's journey, and lots of skulls, representing the peril the protagonist of the story faces. This necklace includes glass links by Stephanie Dieleman, Susan Hanson of Heartsong Beads, and Cathy Collison of Trinket Foundry, wood burnt beads by Heather Trudeau, freshwater pearls, magnesite, dyed chalk turquoise, and Chinese crystal. 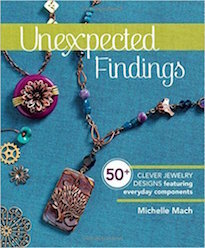 Although most people make jewelry pieces for the book club, it's actually open to any creation made in response to the what is read. Above are handmade cards by Laurel. 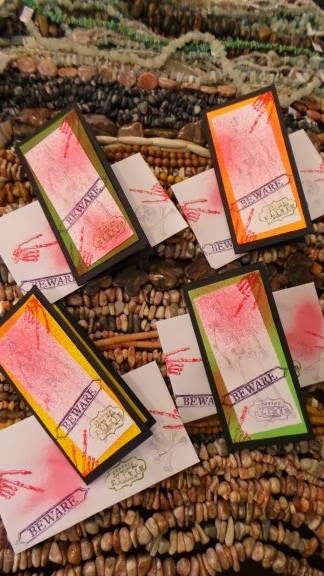 She stuck with the skull theme and created these fun stamped cards! This very modern piece was created by Alison. She made it in response to "First Day of Snow" by Naoko Awa. She used a blend of cool silver and icy whites for a frosty effect. It's so elegant and the chain just feels good to the touch. Alison found inspiration again in "A Case Study of Emergency Room Procedure and Risk Management by Hospital Staff Members in the Urban Facility" by Stacy Richter. In honor of the modernized Prince Charming, she made this bracelet in Harley Davidson colors and included two Nina Design charms: one crown and one skull. Like the story, this bracelet is fun! It's playfully tongue-in-cheek. Alison was really on a roll this month and created this really cool scarf necklace that was inspired by "Ardour" by Jonathon Keats. Alison used a palette of white, silver and pale blue to produce as chilly feel to embody the main character in the story. She also wore this as part of her costume, draping the scarf over her head. It's really cool! Alison said that this book could be a year long project in itself. The stories are so rich with imagery, one could easily create hundreds and hundreds of projects inspired by the pages. For her fourth project, she made a piece inspired by "Catskin" by Kelly Link. It's a cat toy! She designed the toy after the five-tailed tail of the cat-skin suit with ivory buttons. It's a clever interpretation! This necklace is one of Amy's pieces. It's simple, but has great significance. The leaf pendant is supposed to represent the mugwort leaf in "First Day of Snow" by Naoko Awa. It was created (along with the two accompanying beads) by one of her students who was given a rare opportunity to go to an arts-based retreat to learn how to make lampwork glass beads. This piece represents Amy's second creation. She didn't make the necklace, but brought it in as a "show and tell" item. She told us a story about the necklace that was related to "The Color Master" by Aimee Bender. It's a more conceptual approach, but it's interesting how she used an object as a touchstone for something that you couldn't see and could only hear. I imagine that it links back to the history of fairy tales as an oral tradition and how storytellers would use mnemonic devices or would bring staffs or beaded necklaces as "place keepers" in telling epic stories. This necklace was created by Terri. She calls it, "Rechenka's Doll". This piece was inspired by two stories in the book, "Baba Iaga and The Pelican Child" by Joy Williams and "I'm Here" by Ludmilla Petrushevskaya. In creating this necklace, she was also influenced by a children's book called, "Rechenka's Eggs" by Patricia Polacco. 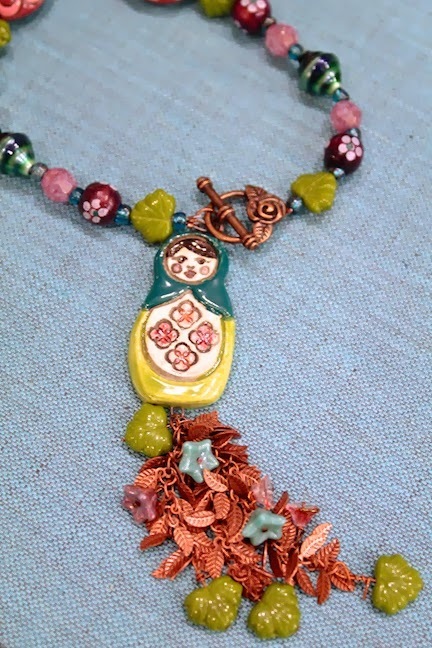 This necklace features an assortment of glass and wood beads, art beads by Golem Studios and Jenny Davies-Reazor, leaf chain, Czech glass, and a floral toggle. Here's a close-up of the focal piece by Jenny Davies-Reazor. Isn't it charming? Terri said that when she saw this piece at BeadFest (back in August), she snapped it up because she knew it would be perfect for this project! This is a necklace that I made. I was inspired by "First Day of Snow" by Naoko Awa. It features a base-metal rabbit pendant with white calcite, antique brass chain, a ceramic bead by Gaea, hand-stamped charms that I made that say, "hop" and one Czech glass leaf for a pop of color and to symbolize the mugwort leaf. I picked through dozens of them to find just the right one that was lighter on the back, just like the story. I could have easily made a piece of every story. I probably could have made half a dozen pieces for every story. When I read, "Bab Iaga and the Pelican Child" by Joy Williams, I had so many ideas, but was a smitten kitten with the imagery of the house with chicken legs. I made this necklace with aged striped Czech glass beads, dotted ceramic rounds from Elaine Ray, a speckled ceramic round from Gaea, and a bumpy lampwork glass bead. I also used leafy chain and created the focal. Here is a close-up of the focal. I made the polymer clay hut (and painted and patinated it) and used bird legs made by Penny Michelle by way of Joan Miller, who uses them in her ceramic birds. This bracelet was made by me and inspired by "Ardour" by Jonathon Keats. For an icy palette, I used cool silver, chilly whites, and sparkly clear crystal. The white beads are leftovers from my "First Day of Snow" piece and the crystals are Swarovski crystals. The lovely ceramic heart component, representing Ardour's wintry heart was made by Gaea. I love using her pieces! 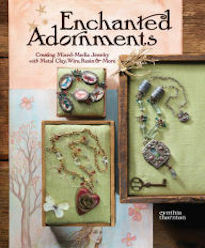 I particularly love using them in these fairy tale-inspired creations. Her pieces are so whimsical. 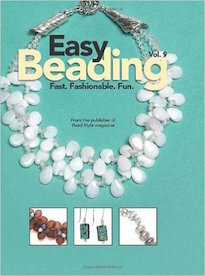 In another piece of news, an advance copy of the January/February issue of Beadwork magazine arrived! 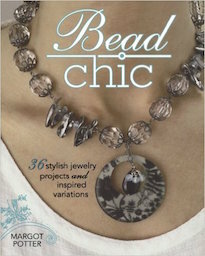 In it, there is a nice little blurb about the group in the Bead Buzz column by Kate Wilson. 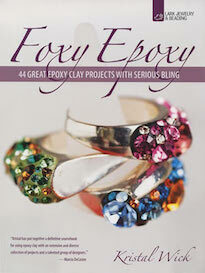 If you get a chance, pick up a copy to show your support of them spotlighting groups like our's! 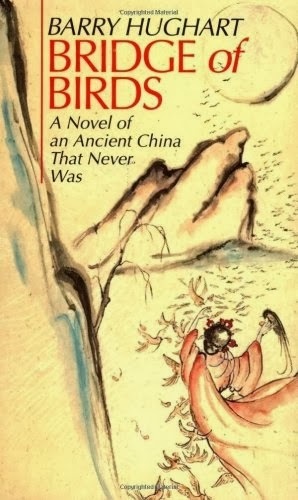 The next book for the book club is, "Bridge of Birds" by Barry Hughart. For the remainder of this year's full list, CLICK HERE. 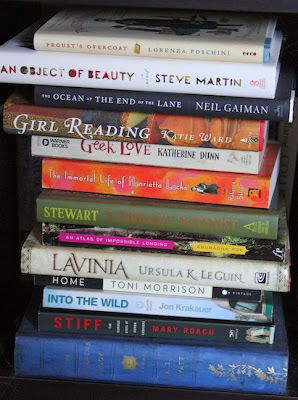 See the end of this post for a sneak peek at the book selections for next year. The in-person meet-up at Allegory Gallery is scheduled for Tuesday, December 3rd! The next blog hop is Wednesday, December 4th! If you're interested in keeping up with what we're doing, CLICK HERE to visit our Facebook group page. CLICK HERE to view our Pinterest page with supplemental inspiration. After careful consideration, these were the book titles that were selected for our next year of reading. It's hard to believe that we've almost completed a full cycle of the book club! In finding books for next year, I had to make sure that none of them were out of print and that they were all available in paperback or relatively inexpensive to pick up. 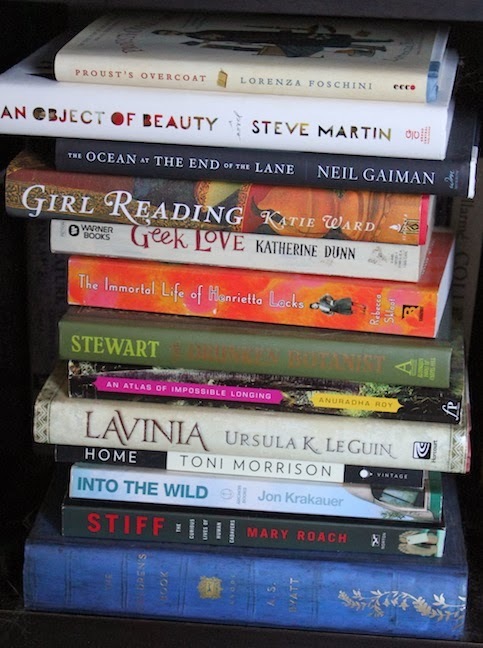 (The first attempt resulted in a few titles that were nigh impossible to locate!) I still have to assign months and will post the official list soon. When deciding which book goes with which month, I try to assign thematic likeness based on the titles and summaries and balance that with major holidays and page counts. It's a big shuffling game played out on my living room floor. If you're looking for a little creative challenge, I hope that you'll join us and be Inspired by Reading. Don't forget! 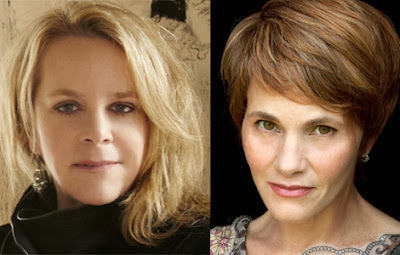 The in-person Inspired by Reading Book Club meet-up is on Tuesday, October 29th from 6PM to 9PM at Allegory Gallery. Keeping with the Halloween season, we'll be dressing up. While costumes are definitely encouraged, they're not required. And please do bring a treat to share! The online Reveal will be all day on October 30th. Check back here for a full list of participants. People across the country will be sharing their pieces that were inspired by our October selection, "My Mother She Killed Me, My Father He Ate Me" edited by Kate Bernheimer. This was our second year participating in scarecrow contest in Ligonier. If you were around last year, you might remember our Day of the Dead-thremed scarecrow, Beadora Strands. She was decked out in Breast Cancer Awareness pink. Since I have never actually seen a dragon in real life – at least not that I know of – I used a deer skull for reference. I formed aluminum foil roughly in the size and shape of the skull. Of course, I added some more reptilian and bird-like attributes to make it less deer-like. After I created the armature, I conditioned pounds of polymer clay and formed the eyes. They're actually hollow and were molded around two light-weight beads. I then started applying the clay to the armature. I placed the eyes in the sockets, smoothed out the clay and blocked out the general contours of the head. At this point, I also had to make sure that there was a way to attach the head to the body. I had formed the aluminum foil around a PVC pipe and had to make sure not to close up the hole. I then added more detail and used a texture tool to add scales. Once I had finished detailing it, I baked it. After the head had been baked, I started working on the ear fans. I don't know if that's the technical term, but I used wire to form an armature and then covered them in clay. I baked the ear-fan-skeleton-armature. Once they were cured and cooled, I rolled out thin sheets of polymer and laid them over the understructure. I pressed the sheets of clay down until they were adhered and shaped them to create the webbed fan look. I baked them again. After they had cooled, I added them to the head with two-part epoxy clay. I didn't have too much time to work on the dragon, so I had to figure out a way to fake the body. Originally I was going to do great big wings and and have a twisting body made out of chicken wire and papier-mache. I had an idea of creating scales by gluing on plastic cabochons and encrusting the belly with rhinestones like Smaug. That would have taken days, if not weeks worth of work and I just couldn't invest that much time into this project. I came up with the idea that the body would be a nondescript bulky shape and the head, hands and wings would be tiny in comparison, but the only things showing. I sculpted the hands faster than I think I have ever sculpted anything before. They took less than ten minutes to make. 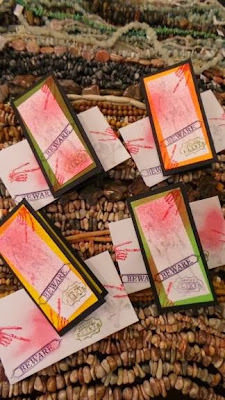 I embedded hooks in the tops of the hands and in the palms so that they could be hung from the body and hold the bag of beads with the Allegory Gallery sticker on it. I started blocking out the shape of the body with trash bags. We recently cleaned out our back room where we store excess packing supplies, so I didn't have as many as I would have liked to. Going against the clock, I ended up blowing up some of the bags with air and stuff the garbage bags to give it more volume. I also had to weight the bottom down so that it wouldn't fall over or blow down. According to the quick sketches I did, the body was supposed to be all in black. I found a graduation gown at the thrift store for a few dollars and an oversized black dress that was stretchy. 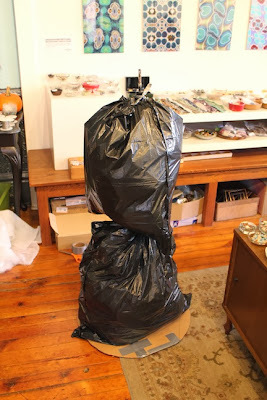 I dressed the plastic bags and taped the dress to the bottom of the stand, so that it wouldn't fly up or shift over the weeks the scarecrow is supposed to be up. I painted the head, hands, and some store-bought wings in record time. I used a PVC pipe and elbow connection to attach the head. And then I stood back and took a look. It looked like it was wearing a burka. I did not make the mental connection that nondescrip-bulky-black-flowy-fabric = burka. This was not my intention, but I didn't have enough time to make it to the thrift store before the deadline to get a new dress or to paint the graduation gown. To make it less "dragon wearing a burka", I found a big piece of red fabric and wrapped it around the neck and artfully pinned it down the back. I wanted to give her the appearance of being a Hollywood starlet in disguise. If I would have had a bit of time, I would have picked up a pair of oversized sunglasses to complete the look. Here she is in the shop wearing a bunch of necklaces. And here she is out on the Diamond. I positioned her next to the column to give her the look of being a shopper passing by, walking along with her recent acquisitions from Allegory Gallery. The nice thing about this spot is that there is a covered awning and it protects her from high winds, rain, and even snow! Even though she didn't turn out quite the way I thought and it was an adventure getting her ready by the deadline, I think she turned out pretty nice. I really enjoyed sculpting on a larger scale. I usually work on much smaller things, so it was kind of nice to work bigger. Throughout the process, I kept thinking of how nice it would have been to have access to the materials, tools, and workspace on FaceOff. I think it'd be a dream to just play there one day, vacuu-forming plastic sheet and pouring foam. After seeing some of the other scarecrows and the elaborate set-ups with multiple characters, lights and props... I don't know if she'll take home a prize, but at least I'll have a pretty cool dragon head. "Try out the tasteful texture of chain in a pair of terrific earrings!" 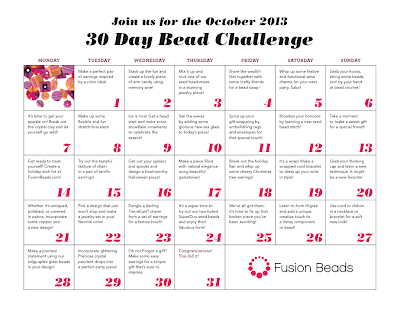 This was our prompt for Day 15 of the Fusion Beads 30 Day Bead Challenge. I started off by channeling classic Lisa Levine jewelry. I remember when she used to have a storefront off of the Lorimer stop on the L train. I would walk by the glowing windows and marvel at her usage of chain. She'd braid it, roll it out, and artfully tangle the links of metal, configuring lovely creations. I think it's important that when you're influenced by someone's work to try and not bootleg it directly or copy their designs, but feel the vibe and interpret it in your own way. For me, it was as simple as going to my chain box. I have been collecting bits and pieces of chain for nearly ten years. I have all kinds of vintage chain, patinated and darkened by time. Some of the pieces are so small that they'd be almost useless for any other purpose. I bundled up the different chain and attached them to an earwire to make dangly, tassel earrings. They're an updated and more modern take on the costume jewelry chain tassels from the 50's. I think they're fun and edgy and I really like the contrast of the brighter chains against the darker lengths. If you're interested in participating or just checking out what the calendar of prompts holds, CLICK HERE. After all of the activities of Fort Days, we were exhausted. Even though we had been on our feet all weekend and our voices were raw from talking to customers all day, William and I could not pass up the opportunity to see Mary Chapin Carpenter and Shawn Colvin at the Palace Theater in Greensburg. The duo performed a "living room style" concert with just their voices and their guitars. In between some of their biggest hits and new music from recently released albums, they bantered back and forth the way good friends do. They joked, told anecdotes and their friendship felt real. It didn't feel forced or fake. It felt as though you were a guest in their living room and they were going to share some tunes and some stories. It was refreshing and a little surprising, how similar their voices in concert sounded to their recordings. All too often we've been disappointed with how other artists can sound so different in their live performances from their digitally remastered tracks. So we basked in their talent and the beauty of their voices and playing. We both agreed that the show was excellent and the perfect way to end a busy weekend. This past weekend was Fort Ligonier Days. Locals fondly call it "Fort Days". It brings in thousands of visitors to see hundreds of crafters, artisans, and vendors. Streets are shut down and there's a HUGE parade. It's a big deal here! There's so much activity going on, that it's all a blur. If you ask me, it's more like, "Fort Daze". This was our third year as a merchant. We had Maria Richmond and Connie Parsons set up in the courtyard selling their jewelry. Jen Palmer was on hand in the shop to answer questions about her encaustic pieces. Each year we learn a little more about how to place the furniture to direct the flow of traffic, how many people are needed to man the shop, and who makes the best fair food! This is a picture of the Chicken Balls with cheese and mushrooms from Miss Meatballs. They were delicious! Of course, we could not pass up funnel cakes for breakfast or stuffing our faces with pierogies! On Saturday, they had the parade. Even though it's crowded and you have to be careful not to get your toes stepped on or get elbowed in the ribs, it's a wonderful slice of Americana. Just imagine a steady stream of bands marching, local celebrities and dilettantes waving, tractors rumbling by, and people singing in costume and throwing batons and swishing flags in the air. It's quite festive! I like the pageantry. In the evenings on Friday and Saturday, there were free concerts. This year there were tribute bands to Journey and the Beatles. People park their lawn chairs in the streets and others dance. It's lively and entertaining. I really enjoy seeing the town infused with so much energy and activity! This was our best Fort Days yet! Even though it's exhausting, there's something special about being a part of the community. There's something special about being a part of a tradition. This was the easiest of the challenges! 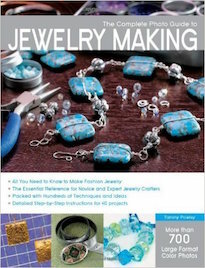 Perhaps it's because I love shopping and Fusion Beads has a great selection of beads and jewelry-making supplies. 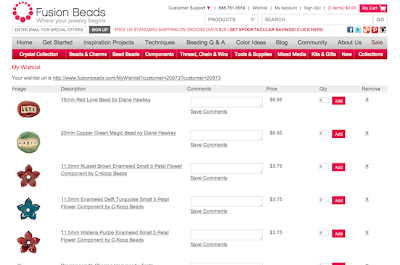 For Day 14 of the Fusion Beads 30 Day Challenge, we were asked to create a Wish List. To see mine, CLICK HERE. It was a lot of fun! I added a bunch of artisan beads, tools, Swellegant, and wire. For the full calendar of prompts, CLICK HERE. For the 13th Day in the Fusion Beads 30 Day Bead Challenge, we were asked to take a moment to create a special gift for a friend. I knew just who I wanted to make a little treat for. Out of respect for her, I won't mention her name, just that she has faced a lot of challenges. Even though she has met one problem after the next, she always manages to wear a smile and somehow makes time to help others. She really brightens the lives of so many! For her gift, I decided to make a simple bracelet. It has wire-wrapped Swarovski crystal dangles attached to a chain. I used Siam-colored crystals, because red is her favorite color. I also added a stamped tag that says, "love". Even though there is adversity, there are those of us out there that love and appreciate her and everything she does. The crystal heart represents her big heart. It's not much, but it's a small token that indicates how grateful I am for her positive influence. To find out what the challenge holds, both past and present, CLICK HERE. 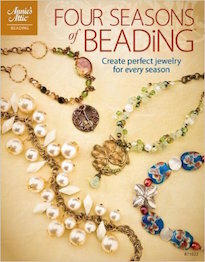 When I started beading, all I heard about was how tricky Right Angle Weave could be. I remember stories of tangled threads, loose beads, and gapping holes. Needless to say, the first time I attempted it, I got about a centimeter done and it looked like someone had chewed it up and spit out. Nerves had gotten the best of me! I decided that there were plenty of other worthwhile stitches out there and that I would shelve it for another day. The 12th prompt in the Fusion Beads 30 Day Bead Challenge said to "broaden your horizons by learning a new seed bead stitch!" I thought that this would be the perfect opportunity to pick Right Angle Weave up again and finally learn it. Here's my first attempt. It's not the best, but it helped me work through the steps and conceptually grasp what I was doing. A lot of times, I can go through the motions, but not really understand a certain technique. I like to really "get it". So I kept going. Somewhere in my sample, it finally clicked. I switched to Swarovski crystal bicones in Light Rose and started again. It was so much easier and in no time I had finished a bracelet! When I finished it, I thought to myself how silly I was to let the opinions of others cloud my ability to master the stitch. Once I set myself to the task and became determined, it all fell into place. To find out what the other challenges are for the rest of the month, CLICK HERE. The prompt for Day 11 of the Fusion Beads 30 Day Bead Challenge was to embellish a gift tag. I decided to make a gift tag by sandwiching a piece of leaf-print cork from Lillypilly Designs, a bit of parchment, and a rectangle of mica. Since the cork is really flexible and bendy, I used the mica to help give it additional rigidness. I held it together with a little spray adhesive on the back of the parchment and eyelets. To attach it to the present, I added some ribbon. The ribbon also gives a little decorative flourish. The great thing about this is that it can be totally customized to make it ultra personalized or to utilize what's on-hand. This technique could be done with scraps of leather, fabric, or colorful (upcycled) cardboard packaging. In lieu of parchment, you can also use old book pages, stamped rice paper, or even actual leaves. For another alternative, you could add a wire-wrapped dangle to one of the eyelet holes with a crystal for a little bling or another bead. For the entire calendar of challenges, CLICK HERE. For the 10th day of the Fusion Beads 30 Day Bead Challenge, we were asked to incorporate sea glass into a design. For this particular task, I busted out the Now That's a Jig! and a spool of copper wire. I used the oval-shaped peg and created these fun links. I suspended the pieces of sea glass in the ovals and created a simple chain out of jump rings (also created with the handy jig) to tie the piece together. For the entire calendar of prompts, CLICK HERE. 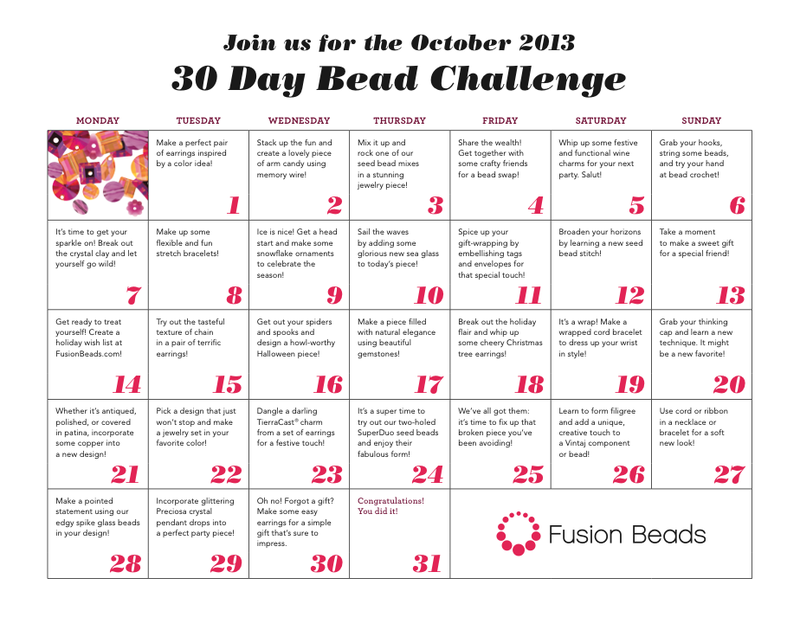 Day 9 of the Fusion Beads 30 Day Bead Challenge brings us this prompt: "Ice is nice! Get a head start and make some snowflake ornaments to celebrate the season!" It's hard to believe that winter is just around the corner and snow is coming! A few years ago, it snowed on Halloween here in Southwestern Pennsylvania. While I don't want to think about the icy cold weather at all, I'm quite pleased with how this turned out and will hopefully do a run of these pendants/ornaments soon. I carved out a snowflake design and pressed it out in polymer clay. Once it was baked and cooled, I then coated it in silver Gilder's Paste and touched it up with acrylic paints. I love the way the interference paint gives the piece a chilly shimmer. I might do some in porcelain. I think that the way I finish the pendants in the tumbler (to give it a satin, matte finish with the details more pronounced) would work nicely. October isn't over yet! There's still lots of time to participate in this challenge. I hope you make some time to participate! It's really enjoyable and I have been creating with wild abandon! CLICK HERE to see the full calendar. The challenge for Day 8 in the Fusion Beads 30 Day Bead Challenge was to "make up some flexible and fun stretch bracelets!" 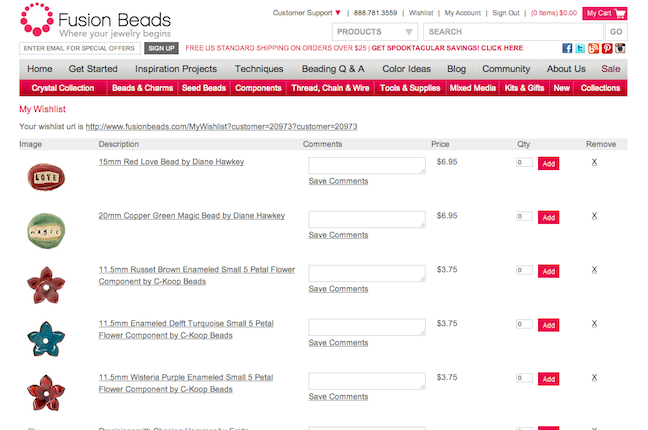 I knew that I wanted to do something a little different than just string some beads on stretchy cord. So, instead, I used some cylindrical, peach-colored marble beads and did an almost "ladder stitch" through them. This allowed the beads to lay side-by-side, instead of end to end. Since I knew that the cord would be showing, I decided to use a colored cord. I used a magenta color and think it is a nice accent against the beads. It was kind of tricky, going through the holes more than once, but it ended up working out. You still have plenty of time to jump into this challenge! It's a fun way to STRETCH your creativity! CLICK HERE for the full calendar.